Global Education Leadership Week (GLW) is a week-long celebration of leadership through global action in K-20 education, taking place this coming week, April 24 - 28, 2017, and organized by the Global Education Conference (GEC) Network. 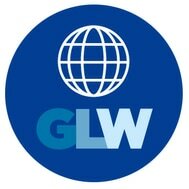 GLW presents opportunities for educators and organizations to learn from one another and share effective leadership principles, particularly within the context of an interconnected, global age. The ultimate goal of this event is to encourage more school and organizational leaders to make global education a priority within their institutions. 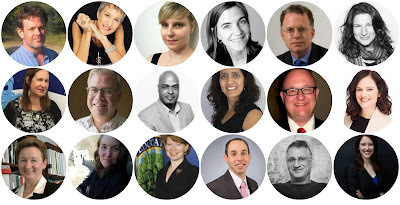 Our flagship event this week is an invite only, face-to-face networking meetup for global education leaders, the Global Leadership Summit, on Monday, April 14th, from 3:00 - 7:00pm US-EDT in New York this year at the Institute of International Education. It is in the schedule below, will be streamed live publicly, will also be recorded and archived on the Global Leadership site. There are four panel discussions this year: ​"The Role and Responsibility of Media in Global Education," ​"Innovation in Global Education," "The Value of Exchange Programs," and "Understanding and Educating for Global Citizenship." 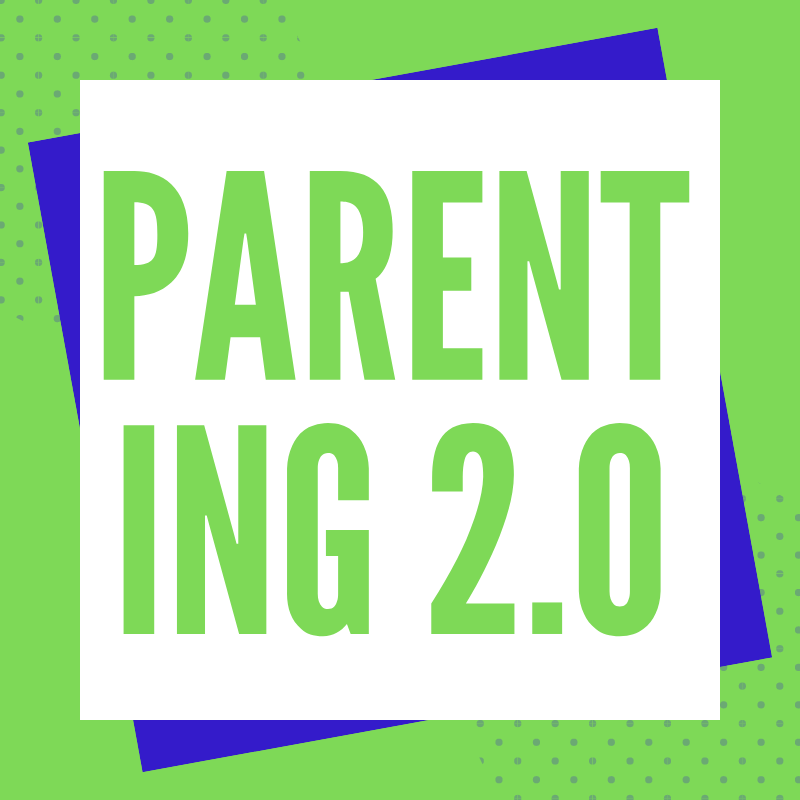 AND we have an incredible lineup of panelists: David Bornstein, Jenny M. Buccos, Holly Ornstein Carter, Dana Mortenson, David Rohde, Karen Blumberg, Karen Kirsch, Keith R. Krueger, Kevin Smith, Waidehi Gokhale, Melvin Harmon, Tonya Muro, Nancy Overholt, Lisa Petro, Maureen McLaughlin, Daniel Perell, Ken Simon, and Megan Wilhelm. See their photos and bios HERE as well as the recording of last year's panels. Our current plan is to stream this event live from our Facebook page: https://www.facebook.com/globaledcon. Now, for the rest of the week's events! Lead 3 Symposium: The Leadership 3.0 Symposium is a collaborative effort of the Association of California School Administrators (ACSA), CUE, Technology Information Center for Administrative Leadership (TICAL). It is truly “for administrators, by administrators.” Three organizations, one mission – Educational Leadership for the 21st century. Growing Global Citizens Twitter Slow chat: We will look at how we can encourage teachers to grow more global citizens. 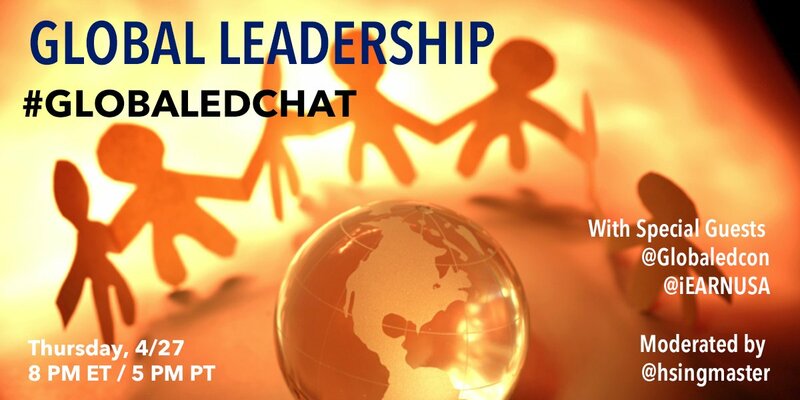 We will be hosting a twitter slow chat using the hashtag #LCPSedChat. Questions will be posted each morning at 9 am Monday through Friday. Please check back regularly to contribute to the discussion. Using social media for leadership development: This event will focus on leadership development through using social media as a strong connection to enhance their inter personnel skills. Students and alumni of the Access English microscholarship program will share their leadership success stories as posted on this group. Using WorldVuze to Foster Critical, Creative, and Collaborative Global Thinkers! Learn a new and exciting way to foster your students’ critical, creative, and collaborative thinking skills by using a free global student discussion platform, WorldVuze (www.worldvuze.com). On WorldVuze, your students can safely communicate their own perspectives on complex topics from democracy, poverty, climate change and urbanization and learn from the multiple and diverse perspectives of their peers around the world. Join a walk-through of the WorldVuze platform led by one of its' co-founders and explore ways you can actively engage your students in your curriculum through authentic, safe, and meaningful global dialogue by joining a discussion or by starting your own as a class. Stevens Initiative Virtual Exchange Forum: The 2017 Stevens Initiative virtual exchange forum will serve as an opportunity for Stevens Initiative awardees and other virtual exchange practitioners to share the impact of their programs. It will also allow experts and stakeholders to chart a path for demonstrating the impact of virtual exchange, reaching new communities, and setting a learning agenda for the field. The Stevens Initiative is an international effort to expand access to virtual exchange to build global competence for young people in the United States and the Middle East and North Africa. The Initiative is a lasting tribute to Ambassador J. Christopher Stevens, a public servant who dedicated himself to building understanding between people from different countries. The Initiative is housed at the Aspen Institute and is a public-private partnership of the family of Ambassador Stevens, the U.S. Department of State, the Bezos Family Foundation, the John D. and Catherine T. MacArthur Foundation, LRNG, Vidyo, Twitter, Microsoft, and the governments of the United Arab Emirates, Morocco, and Algeria. Learn With the World through Global Project Based Learning with iEARN: Are you looking to connect your class to learn with the world? Join our 30 minute session on Facebook Live where we will share how iEARN is engaging educators and youth to in global, collaborative projects to make a meaningful contribution to the health and welfare of the planet and its people. In this session we will review best practices, tips, and advice for building connections with educators around the world and beginning online, collaborative projects. During this event we will share and answer your questions related to: Identifying strategies for networking with educators from different countries and building project teams; Reviewing tips and advice to prepare students for online global communication and project work with their peers; Sharing examples of global collaborative projects for different ages and subject areas. Globaled.tv: "Labeling: The Impact of Of Placing Names on Others." GlobalEd TV is a free, inclusive, and comprehensive webinar series which spotlights theories and best practices related to multiculturalism in schools and organizations all over the world. This 5-part series is hosted monthly by the Global Education Conference Network, the Learning Revolution and Know My World, and is designed to inform educators, students, and parents about the role of cultural and global competence in education. Join us for part 3 of the current series "Foundational Attitudes and Projects for Global Citizenship" in which we will explore labeling and the impact of placing names on others. This session will provide a developed project sequence by Know My World, real life examples of implementation in the classroom and researched theories behind the activity design. A transformational study abroad experience in Costa Rica - Start with UPEACE! The Centre for Executive Education at the UN-mandated University for Peace partners with academic intuitions of all levels, from middle schools to doctorate programs, to create customized, powerful learning experiences that use Costa Rica as our campus. 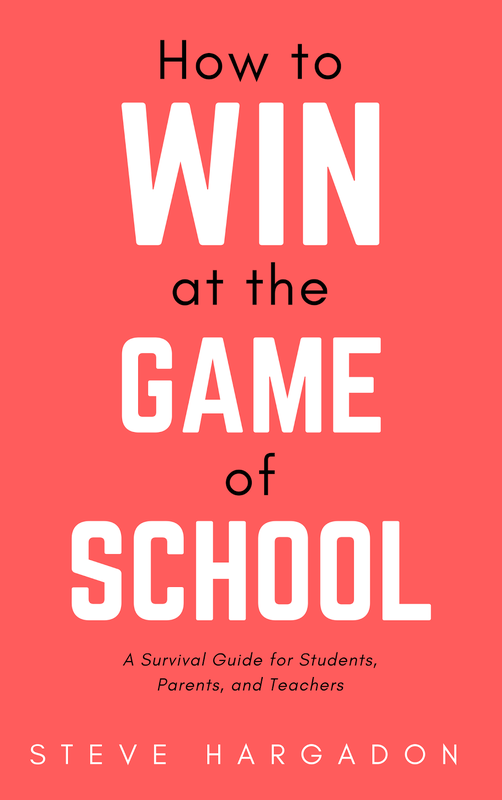 We cover all the logistics to make it easy for you, and draw on a deep network of on-the-ground partners to set up a unique experience combining classroom time, dynamic workshops, and visits to local businesses and organizations exemplifying the concepts we’re teaching. We’ve run courses in many areas including language & culture, social responsibility, human rights, business, peace studies, education, sustainability and much more. We know starting the process can be daunting! We’ll share examples of past programs to help you imagine the best short-term study abroad program for your institution, and we’ll talk you through how the process works. The Catalyst Conference (through Sunday): Global Online Academy's second annual online conference brings together more than 300 students seeking to spark change in their communities. These students have designed interactive projects that transform their coursework into real-world campaigns for change. Conference attendees are invited to view, discuss, and share this work. Free and open to the public. Catalyst Conference Keynote: Sean Maguire of Plan International. This is a free, live video event with Sean Maguire of Plan International, a global advocacy organization dedicated to children's rights. Plan International launched to "Because I am a Girl" campaign. Inspire Action for Global Good through #TeachSDGs: Join in this special Twitter chat to discover ways to bring the Sustainable Development Goals to classrooms and support the work of the United Nations to meet the agenda for sustainable development by the year 2030. Together with UNICEF's World's Largest Lesson and TeachSDGs, discussion will center on projects, resources, and global events related to global education and the SDGs. Come and create your action plan to make positive change for people and planet through educational initiatives with our world of students! Cultivating Global Competence in California: California International Studies Project Executive Director Emily Schell hosts California Department of Education's Education Programs Consultant Letty Kraus in this webinar to share statewide efforts to develop and promote global education in K-12 schools. Participants will learn about and share their ideas about statewide recommendations, a new network for global educators, resources, and professional learning opportunities. 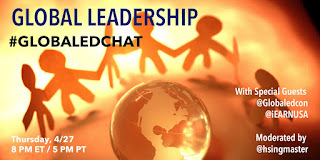 #GlobalEdChat on Global Leadership: This is an interactive, online chat open to anyone around the world who would like to discuss Global Leadership. It will be led by iEARN and The Global Education Collaborative! Purposeful Creations: Using the Arts for Sustainable Development + Social Good: The power of art, music, dance, & creative forms of literacy to share a message with the world! Join for a Twitter chat with global PLN educators and educational organizations to discuss ways art can be used in our schools and communities to inspire positive change for people and planet. Connections to community art, the Sustainable Development Goals, various forms of multimedia, and tech tools for creation will be explored, and participants will have opportunity to share ideas from their classrooms and experiences. Join for this special session as we showcase and celebrate the ways the arts can impact our world. Water, a Vital Element: My ESL students and their families, as well as global guests will be expressing themselves through a collaborative Padlet at the end of the session. They are invited to share their thoughts and feelings regarding the topic we selected for the event: “Water, a Vital Element.” Through the Sway presentation, we will be reflecting on the importance of understanding global issues as a way of directing our personal and professional projects based on leadership to foster and support 21st Century hard and soft skills in the context of real world and local problems. Open for learning: This asynchronous event will present resources to support open educational practice and connected learning opportunities. Please engage with the resources using the links below, where you will be able to comment and interact. 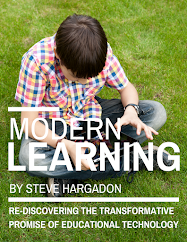 Here we can explore the boundaries of learning, connect to networks which can support your learners and acquire new skills in order to create more effective, internationally connected learning opportunities for all. 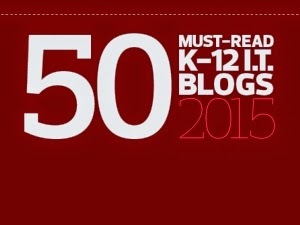 Registration is not necessary, you can make use of these resources whenever suits you. All we ask is that you contribute to the discussion through commenting, completing the survey or sharing using the #wihea tag in any social media posts.